I consider myself a “newbie” in the wonderful world of crochet. I’ve only been crocheting since October of 2012 and I constantly ask myself, “why didn’t I learn this decades ago?” Learning to crochet has improved my life in so many ways and has opened up a whole range of creativity that I didn’t think I had in me. We artists are quite fortunate because creating our art, which ever form that may be, allows us to be as creative and imaginative as far as our minds will take us. There are no “rights” or “wrongs” to our creations. We just need to be true to ourselves and our visions. The ability to create something from just our imagination is a gift and a blessing that we must embrace. Crochet gives us the freedom to create what ever we desire! From hats, blankets, clothing, accessories, toys, home decor and so much more. It is most definitely a great medium to express our creativity and imagination from color selection, yarn selection, design and construction. The possibilities are simply endless! The question is… what can’t we make with crochet??? Here are some of my creations that I’ve done in the short 1 1/2 years of my crochet life. My daughter wearing my handmade crochet hat. Hats are a great way to start when learning to crochet. It doesn’t take a long time to construct, you can add on flowers, bows, jewels and you can choose from an array of yarn combinations. My first Felted Crochet purse. 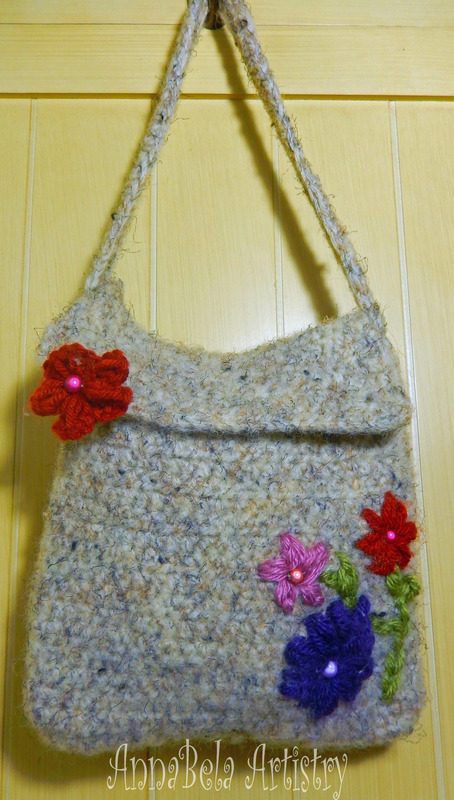 This was my first Felted Crochet Purse. I was inspired by All Free Crochet’s YouTube Tutorial. It doesn’t take a long time to make, they’re functional, you have great options on wool yarn, you can add wonderful accents like flowers and beads, plus you can create wonderful closures by adding metals, buttons, wooden beads, etc. Dudley wearing my Crochet Doggie Sweater. 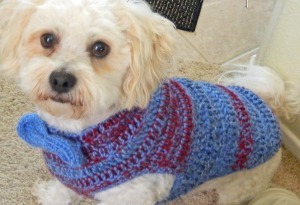 One of my favorite things to create are dog sweaters for my own 4 legged loved ones. It’s a great way to show off different combination of stitches, color combinations, sizing options, edgings and accents like bow ties, beads, bows, flowers and frills. My daughter modeling my crochet hat and dress set. 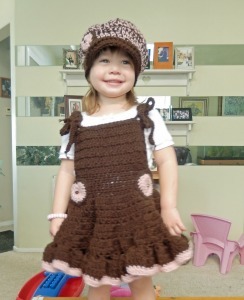 Getting on the more adventurous and challenging side, is my Toddler Jumpers Dress with Hat set. This took a bit longer to create and many trials and errors, but well worth it in my opinion. I added heart pockets accented with beads on the sides and adjustable straps to add versatility. My first Crochet Challenge Entry for the Mad Hatter’s Challenge. The Mad Hatter’s Challenge is my wildest creation to date. I truly enjoyed this challenge as it really forced me to think outside of the box and let my imagination and creativity run wild. This challenge has opened up a whole new world to me and I’m anxious to see what I can offer it. These are just some examples of what you can create with crochet. There are literally thousands upon thousands of possibilities out there and I, for one, am excited to learn and create them all! So, whether you are a “seasoned” crocheter or a “newbie” like myself, let yourself be free. Create what inspires you, do what you love, push and challenge yourself to achieve that vision. I would love to see and read about your wonderful world of crochet, so please post away. Imagine & Envision. Design & Create. Crochet! This is Anna Zetterberg of Chit and Chats, AnnaBela Artistry and guest blogger for Knot just Yarn. 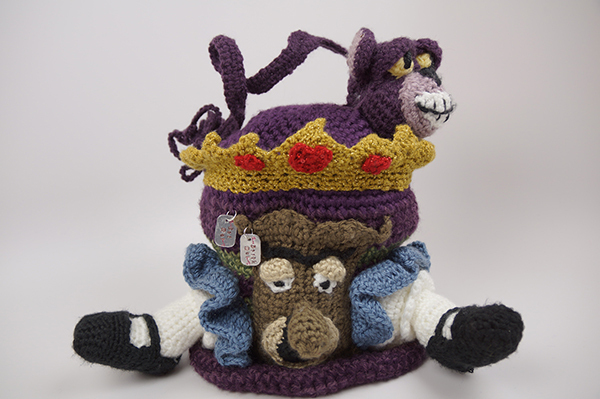 This entry was posted in Chit & Chat: Anna Zetterberg and tagged Alice in Wonderland, Anna Zetterberg, AnnaBela Artistry, Chit and Chats, Creativity, Crochet, felted crochet purse, ideas, Inspiration, jumper dress, knot just yarn, Mad Hatter's Challenge, newsboy hat, pet sweater, TheCrochetCrowd. Bookmark the permalink. Hi Anna, Welcome to the Crochet Crowd. I’m looking forward to your guest posts and will definitely be popping over to your blog to check that out. Thank you so much, Diane! This is most definitely a huge step for me and I’m so thankful to the community for welcoming me with open arms! I love the creative outlet crocheting gives me. I learned from my grama and my mom. My grama used to make the prettiest crocheted edgings to her pillowcases she embroidered. My mother and grama passed along the love of needlework and crochet to me, and I have to my daughter. So I guess it is a way to connect our generations now that my mom and grama are gone. Oh and I’ve heard bang on, but on the BBC LOL. You’re very lucky to have had such a great art passed on to you. That type of know how and knowledge can’t be duplicated when you’re trying to learn on your own. Plus the great memories you have that you can pass on to your children. It’s like keeping your elders alive through the art of crochet and needlework. That’s truly beautiful! Thank you for sharing. I must be “Out to lunch” on this one too. Is it the same as “Right on” used in the US? LOL I think we’re all out to lunch!